I like organization, schedules, and calendars. I like checking things off to-do lists. I am as Type-A as you can get it when it comes to order. Lately I have been binge listening to Gretchen Rubin’s podcast, Happier. I really enjoy the perspective on life, attitude, and relationships and HIGHLY HIGHLY recommend it - worth the listen. The past few episodes, Gretchen has been referring to her book Outer Order, Inner Calm - a book about organizing your house and life to be a more efficient and relaxed person; or at least, that’s what I’m getting from the podcast since I haven’t read it (yet). Suffice it to say, I absolutely already agree with the premise: for me, when the house/car/office/desk is clean I am at peace and if it is in chaos my mind literally cannot focus until it is. A few months ago I was doing a phone psychic reading (yes I believe in ALL of it - psychics, crystals, energy, meditation - you name it) and she brought up my intense need for order and organization. We were discussing it and how much of my day it consumes in terms of time and energy - my thought was that she was going to tell me to either outsource it to a housecleaner or let it go - but she didn’t. Instead, she summed it up that for me, cleaning and organization is my therapy; it’s what I do when I need either my mind or body or both to calm down; in fact, it is a form of yoga for me and not only do I need to continue, it is actually something that helps me repair and re-energize. Coming back to the master bath. The vanity came in and I LOVE it but realized shortly after installation that it had about 30% less storage than I was used to in the old bathroom. There was no going back so I headed to The Container Store. It wasn’t as easy as I had hoped - I thought I would find everything I needed in the bathroom section. 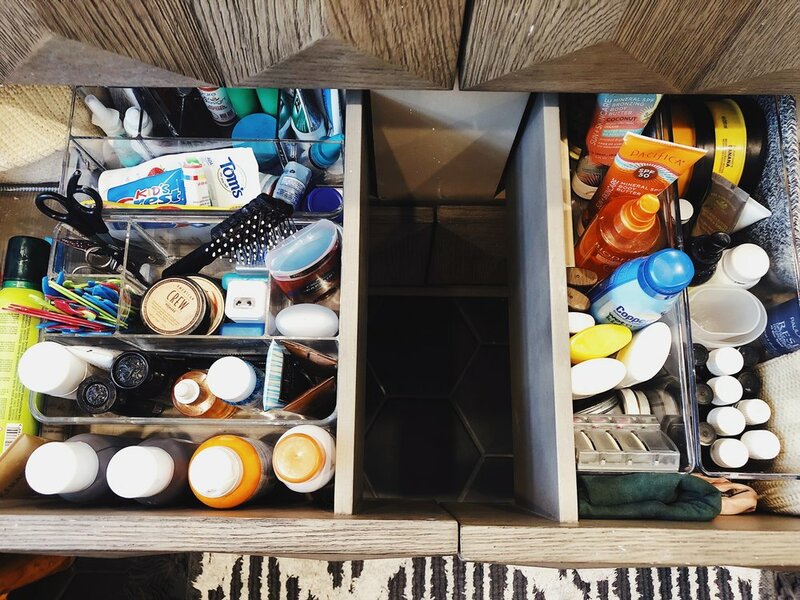 And I did find SOME - a few acrylic storage trays - but for the most part the bathroom storage was too specific - I wanted flexibility in my organization, not cubes that were only built for nail polish bottles. The end result of trolling The Container Store for over an hour was a harmonious mix from all over the store - fabric boxes for large storage that could also change shape, a few bathroom acrylic dividers, but the MOST FUN and best storage was found in the kitchen section - storage for refrigerators and freezers. GOLDMINE. Still acrylic so clean and a bit invisible, they have all shapes - I got a few large bins with some depth and some long, thin, rectangular bins. They were also a lot cheaper than the bathroom storage and when they are all mixed together, they look exactly the same. Now we have organized sections for hair, teeth, sunscreen, face, makeup, and first aid with room to spare AND with all of Captain’s products in with ours since his bathroom is still under construction - winner winner, chicken dinner.